It’s the best time of the year because Cookie Season is finally here! 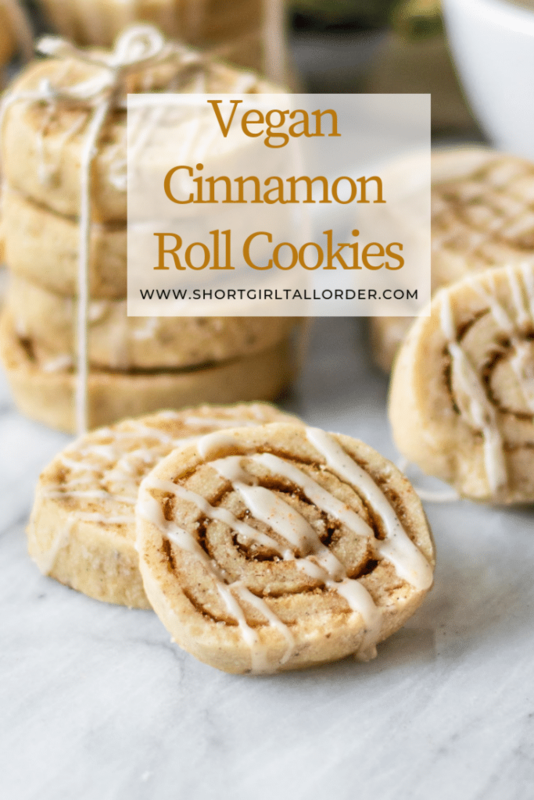 So get ready to make these VEGAN CINNAMON ROLL COOKIES for every holiday party, cookie swap, or as a gift for friends because they are THAT good. DO use cold butter for the dough and take the time to really whip it until creamed! This leads to a really great texture in the dough because it helps incorporate air into the batter. It also gives this dough some of the crucial structure vegan baked goods need because of the lack of eggs. DON’T freeze or chill the cookie dough prior to rolling it out. This will lead to cracked cookie dough and it will likely fall apart when you try to roll the dough. I made this mistake the first time and, as you can imagine, it was quite a mess. DO freeze your dough before slicing. Once you’ve rolled your dough into a large log, you’ll want to freeze the dough. I cut down dishes by freezing it on the same parchment paper and baking tray that I end up baking the cookies on too! Doing this step helps the cookies maintain their shape when cutting and when baking and leads to cookies that are perfectly swirled. DON’T add butter to the filling layer. I tried to incorporate adding melted butter like in a traditional cinnamon roll, but found it warmed my dough too much and made it incredibly hard to roll the dough. Using brown sugar and cinnamon in the filling adds plenty of flavor so I promise you will still get that cinnamon roll taste. The end result is a cookie that is the consistency of a shortbread cookie on the outside, with soft sugary swirls in the center. 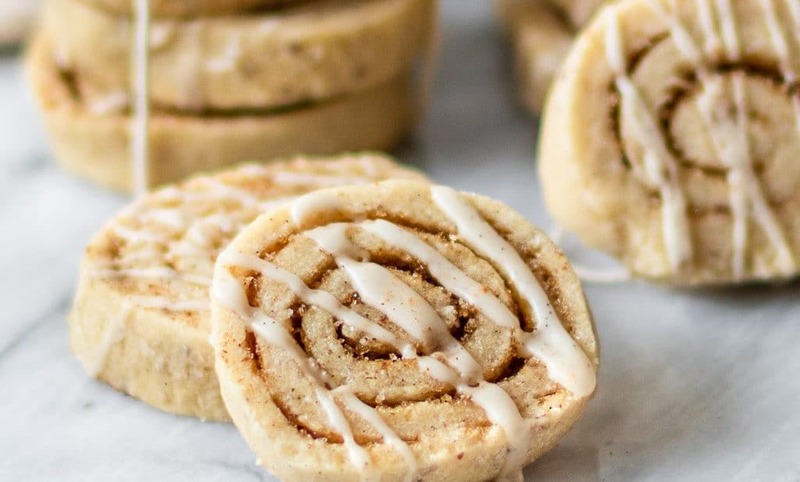 Like a cinnamon roll in cookie form! 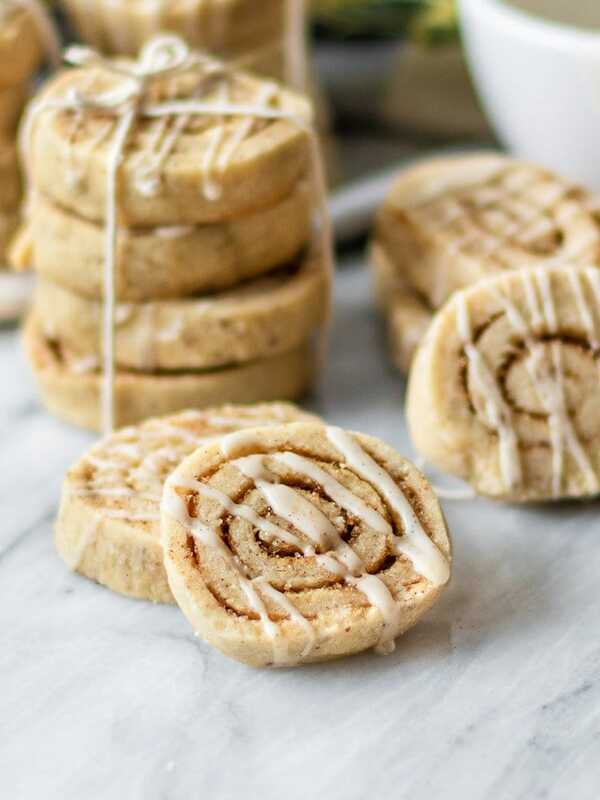 As a final step, you will drizzle on some vanilla bean glaze to really give these cookies the full cinnamon bun look and taste. Let the glaze sit at room temperature at least 30 minutes to harden or pop in the fridge for about 10 minutes to speed up the process. December is always a funny time of the year for me as I grew up celebrating both Christmas and Hanukkah. I went through the stages of loving it because it meant double the gifts, to being conflicted because I didn’t have a clear “identity”, to now feeling grateful that I got the best of both worlds. To add more confusion to the mix, my boyfriend Jacob is from Denmark where they celebrate Christmas on Christmas Eve. I’ve always spent Christmas eve surrounded by Jewish friends and family eating heft amounts of Asian food, so it’s definitely been an adjustment to open presents and eat a homemade meal on Christmas eve instead. Despite all this food confusion, one thing that I love about baking this time of year is that it’s something every culture can enjoy and participate in. For Hanukkah, it means challah, rugelach, and latkes. For Christmas, it means all the cookies and sugary cakes. Or if you’re from Denmark, it means risalamande (a cold rice puding with a cherry sauce and a hidden almond inside). Whatever Holiday you celebrate and wherever you may be celebrating this year, I can promise you these cookies will be a hit for any festivity! 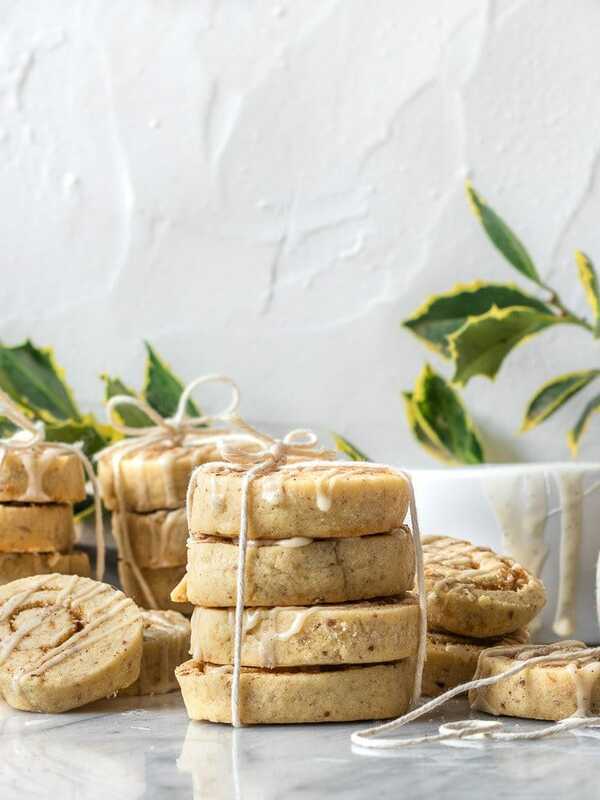 Truly the perfect vegan holiday cookie! 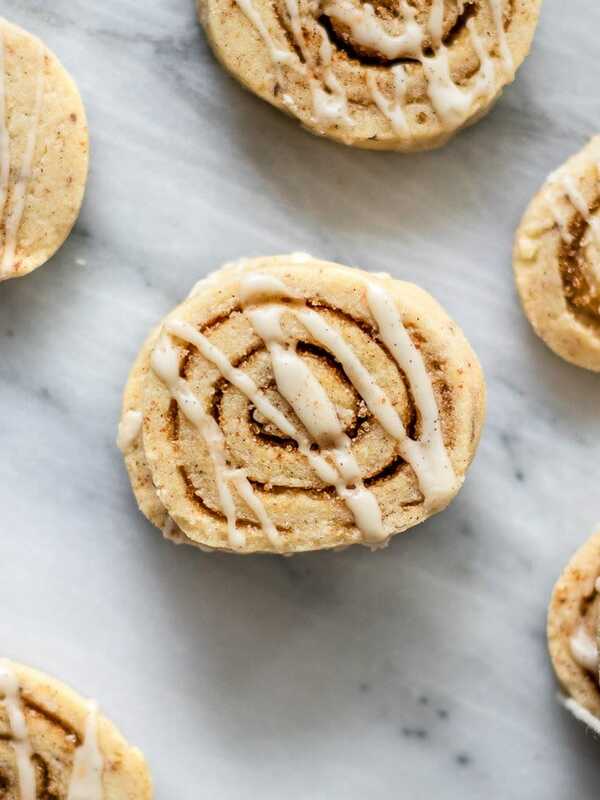 I hope you enjoy every bite and, as always, don’t forget to comment below and shar your cinnamon roll cookie baking adventures! However, don’t fill up too quickly, because Cookie season is far from over on this blog. Happy Holidays & Happy Hanukkah to all my friends and family celebrating this year! P.S- If you are looking for more Vegan Cookie ideas for this season I also recommend checking out my Vegan Pumpkin Chocolate Chip Cookies or these Vegan Funfetti Cookie Dough Sandwiches that were even featured on BuzzFeed! I totally believe that part of what makes these cookies so good even though the ingredients are incredibly simple is good flour. I am a huge Bob’s Red Mill Fan & used their Organic All-Purpose Flour for these cookies. I bake all my cookies on Unbleached Parchment Paper and absolutely love the texture of cookies baked this way. For this recipe specifically, I don’t recommend cooking without parchment paper. Plus, this parchment paper is compostable- win-win! This is not an affiliate link, but I have officially discovered the BEST Vegan butter to bake with- Miyoko’s Kitchen Cultured Vegan Butter! Beyond just loving the taste of it, I love the ingredient list too. It’s free of lactose, gluten, soy, and even Palm Oil. So far, this is the cleanest list of ingredients I’ve found for a vegan butter that actually tastes good. I’ve been able to find it at my local Trader Joe’s, so definitely check if a grocery store by you has some! Begin by sifting together your flour, salt, and baking powder in a mixing bowl and set aside. In a separate mixing bowl add your cold vegan butter and sugar and use a standing/electric mixer to whip until the butter is creamed (about 2-5 minutes). Once creamed, add in your flax egg and vanilla bean paste and mix to combine. Next, gradually add your sifted dry ingredients to the standing mixer and mix until a thick cookie dough is formed. Before removing the cookie dough from the mixing bowl to roll out, generously flour your rolling surface and rolling pin. Gather the dough into a ball, place it on the floured surface, and roll it into a 1/2-1" thick rectangle. Make sure not to roll the dough too thin else it will not hold while you are rolling up the filling. In a small bowl mix together your brown sugar and cinnamon from the filling ingredients. Take the filling and sprinkle evenly over the dough. Then, roll the dough from the shorter end into a long log very slowly, tucking the filling in as you go so that there are no air pockets. You don't want gaps of air between the dough as they will cause your cookies to spread and lose their shape while baking. If the dough cracks at all while you roll it up, lightly press it back together so it holds and continue rolling. Lay parchment paper on top of a large baking tray and place the rolled up cookie log on top. Place the tray with the log in the freezer for at least 15-20 minutes to solidify before cutting. After 15-20 minutes, remove the dough from the freezer and preheat the oven to 350F. Cut the dough into 18-20 even slices that are about 1 inch wide. Lay the slices onto the same baking tray covered in parchment paper, making sure to leave space between each cookie. Bake for 12-14 minutes until firm and very lightly browned. Remove from the oven and let cool on the baking sheet about 5 minutes. Then, move to a cooling rack to cool completely before icing. While the cookies are cooling, make the icing by combining the powdered sugar, vanilla bean paste/extract, and almond milk in a small bowl. Whisk until a smooth, but thick, glaze has formed. Drizzle over the cooled cookies and let sit 20-30 minutes at room temperature to harden the frosting. Enjoy! Recipe lightly adapted from Sally's Baking Addiction Cinnamon Roll Cookies.